You are here: Home » BRIGHT COLORS ARE BACK!!!! The United Colors of Benetton comes to mind when I think of brightly colored clothing. Wearing a yellow cardigan with a pink shirt is far from acceptable in my neighborhood. Color is something people from the Caribbean embrace, so it made sense when my West Indian mom, new to the states, would dress me in brightly colored clothing and send me off to school. Kids would laugh at me and ask “where’d you get those colors from?” The cruelty in children stem from their parents, and/or other dominating influences that surround them. I’m laughing now because many things deemed unpopular eventually become mainstream. Now mixing and matching colors is cool to an extent. I recently asked my boyfriend “how do I look?” and he responded “colorful.” I felt uncomfortable with his response, and found myself explaining to him that colorful is in style. As I type this, I reason with myself by asking “whose style is it, and where is colorful considered stylish?” I spend a lot of time in the City, and although the Bronx is a 15 minute train ride from areas of Manhattan, the two boroughs are worlds apart. In New York City, style is different borough to borough. 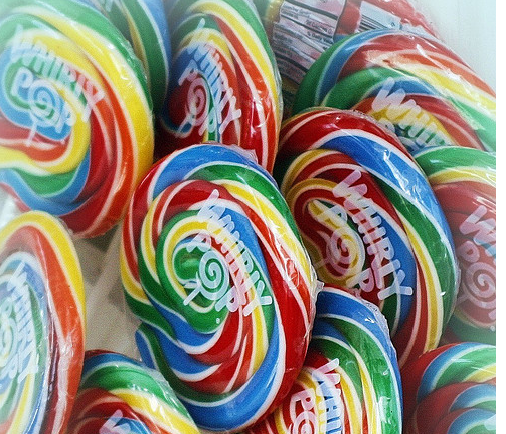 I’m super excited that I can dress like a Whirly Pop and look as sweet as the colorful candy taste. Bright colors add life to a drab wardrobe. Adding color to your wardrobe can boost your mood. If you are an attention seeker, it’s the perfect way to command attention. Outside of clothes, take a chance with brightly colored make-up like lipstick and eyeshadow. Try going neon with your nail color or a pair of pretty pumps. It’s time to get out of the dark and into the bright.